Successful purchasing processes on mobile devices can be easily spoiled by bugs, and errors in layout. 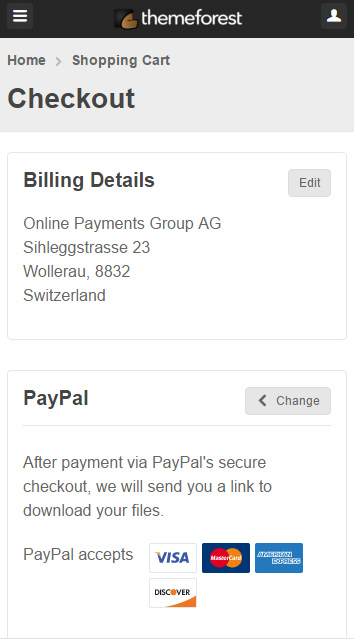 How the payment page is displayed on devices, depends on HTML/CSS code. It is crucial that everything is legible, and adjusted to the devices display resolutions. Your payment page are loosing clients on the redirect page. You could increase your conversion by approximately 2.5%. The credit card number can be verified within the input. This gives instant information to the user about the correct card number. The credit card number can be recognised within the input. This gives instant information to the user about the card brand, and positive verification. Payment page should be displayed correctly on every browser and operating system. Otherwise clients may not be able to finalise the purchasing process. Redirects to PayPal are causing users disruption while finalising the buying process. The main reason for this is that the new website is in different colours and layout. The only connection with the product page is the logo in top left corner. It is far too little to minimise concerns. Login to PayPal is also a disruption. First of all, the users need to have a PayPal account and remember their login, and password. The second issue is that users who do not have PayPal accounts are asked to fill in 15 text fields. Every additional input minimises conversion, and leads to abandoning the purchasing process. Here, PayPal also realises its own business goals – new client acquisition, which is connected with two additional check boxes.